A word about spoilers in this review: For the most part, I have tried to avoid them. However, there is one development that I will openly reference. For many people, especially those who know about the behind-the-scenes details, this won’t be a surprise. However, it is a major plot point and those approaching the movie with a blank slate might not want to know about it. The first three paragraphs are safe to read for anyone. Those who have no clue what I’m hinting at, however, may want to come back after seeing the movie before proceeding beyond that point. When Marvel mapped out the trajectory for their Cinematic Universe, they were sometimes criticized for overthinking and overplanning. Nearly every major hero – Iron Man, Hulk, Captain America, Thor – had his own movie. Many of the secondary characters (including the villain) boasted significant screen time in one or more of the first five films. Only once all these things had been accomplished were the characters brought together for The Avengers. The formula worked. The Avengers was popcorn bliss, a superhero nirvana. DC, however, came late to the party. Riding the critical and popular success of Christopher Nolan’s Batman trilogy and smarting from the disappointing performance of Bryan Singer’s Superman Returns, they dithered and dallied and didn’t begin planning out the post-Dark Knight campaign until the MCU movie count was past the half-dozen mark and rising. The late start resulted in a rushed and ununified approach. Justice League arrives with three major characters who haven’t previously been introduced. As a result, this film has a lot of heavy background lifting to do - too much, in fact, for it to be able to tell a worthwhile story. 70% of the movie is set-up for future tales. The rest is an overlong smack-down between our heroes and possibly the worst villain ever to appear in a comic book picture. Marvel movies, for all their flaws, are almost always fun. Yes, the action and plotting follow familiar trajectories but there's usually wit in the screenplay and energy in the execution. Why is it that so many recent DC films (Wonder Woman excepted) feel like work? Why are the visuals so dark and muddy? I’ve said it before: Christopher Nolan understood how to make the darkness organic and necessary to the films, a part of their essential DNA. Not so with the DCEU films. The only one that really succeeds, Wonder Woman, does so in large part because director Patty Jenkins subscribed to a different aesthetic. Even though Zack Snyder was replaced late in the proceedings by The Avengers’ Joss Whedon (as a result of a personal tragedy), Justice League adheres too closely to the tone that hamstrung Man of Steel and Batman v Superman. 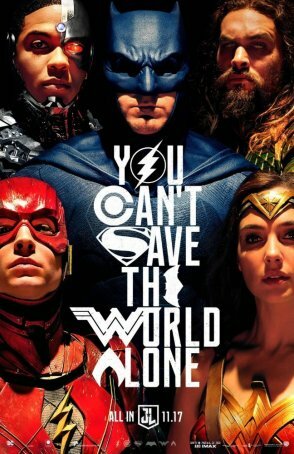 Yes, there are more one-liners and some openly comedic scenes but there’s a vast gulf between the oh-so-serious events of Justice League and the antics of Thor: Ragnarok. Narrative-wise, Justice League is forced to do too many things. It has to re-unite Wonder Woman (Gal Gadot), fresh off her own film, with the Ben Affleck iteration of Batman. (Because Affleck hasn’t yet gotten his own stand-alone film, we still don’t really know this rendition of The Dark Knight, except that his costume is bluer than his immediate predecessor’s and his Bat Cave is more high-tech. It would have helped immeasurably if the DCEU had taken the time for a proper re-introduction of a signature character.) To help in that department, it brings back supporting players Queen Hippolyta (Connie Nielsen), Alfred (Jeremy Irons), and Commissioner Gordon (J.K. Simmons). The movie also has to introduce Aquaman (Jason Momoa), The Flash (Ezra Miller), and Cyborg (Ray Fisher), and provide them with mini-origin stories. Then there’s the necessity of resurrecting Superman (Henry Cavill), because that character remains a key foundation of any DCEU movie even though he “died” at the end of Batman v Superman. Lois Lane (Amy Adams) and Martha Kent (Diane Lane) are on hand to represent the Superman support section. As if all this wasn’t enough, Justice League also feels compelled to give us a Big Bad Guy whose muddled purpose has something to do with becoming a new god and possibly preparing the way for Darkseid, who might end up becoming the DCEU’s version of Thanos. This McGuffin-villain, Steppenwolf (a motion-captured Ciaran Hinds), has a poorly-defined backstory and no personality beyond crush-destroy-burn. He provides the catalyst that brings the Justice League together. In the grand scheme of things, he is inconsequential. Although screen time is carefully parceled out, Snyder ensures that each Justice League member gets a moment to shine. In the wake of Wonder Woman’s success, one might expect to see more of Diana Prince in the final cut but the massive box office windfall from that film hit too late for her role to be substantially beefed up for Justice League (although she still has more screen time than anyone other than Batman). Fortunately, there’s good chemistry among the various actors and the yin/yang friendship/rivalry aspects of The Justice League members work well. Of the supporting cast members, Amy Adams and Jeremy Irons are well-utilized. Everyone else is extraneous. There’s a lot of battling during Justice League but much of it falls into the been-there-done-that category: explosions, waves of power, bad CGI, superheroes getting knocked down only to get up again, etc. It’s all familiar by now and not all that interesting. Steppenwolf is a lackluster bad guy whose powers were taken from the Comic Book Villain Cliché Shelf and whose eventual fate provokes little more than a yawn. While Justice League mostly succeeds in assembling the title team and getting the internal dynamic right, it fails in crafting a memorable or imposing villain. Kudos to Danny Elfman, who went back to basics for his score, drawing heavily on his own theme from Batman (1989) but not ignoring the previous work of other composers (both recent and not-so-recent). I also loved the use of Leonard Cohen's "Everybody Knows" as the opening theme. However, it's not a good sign when I have to fall back on the music as arguably the most praiseworthy aspect of Justice League. Now that Warner Brothers has gotten this movie out of their system, maybe they can take a step back and spend a few movies developing the characters and the DCEU in general. At the moment, Justice League 2 has neither a crew nor a release date, which is probably a good thing. The next time these characters band together, perhaps they will do so with stronger backgrounds, a real sense of purpose, and a story that’s more than a cobbled-together mess. In concept, The Justice League has more potential than The Avengers. Now it’s up to the DCEU scribes to tap into that potential and make it real – something they have thus far failed at in four out of five tries, including this one.